Do some good for the environment and jazz up your wardrobe while you’re at it. Jeans. Most of us have a pair or two (or ten). The classic wardrobe staple dates back to the 1870s when Levi Strauss created the resilient garment that’s now worn on every occasion from a laidback weekend to date night to casual Fridays in the office. While jeans have been around for almost two centuries, the material isn’t so friendly to the environment. According to Greenpeace, the average pair of jeans requires 7,000 liters of water to produce. With two billion pairs produced every year, that’s a lot of H2O. But clothing company Madewell launched a Denim Recycling program that attempts to rectify those scary numbers. Whether you’re trying to be more eco-friendly or sticking to your resolution of cleaning out your closet, you’ll want to know all the deets on this initiative. What is the Madewell Denim Recycling program? Madewell’s recycling program was implemented in 2014, but if you haven't heard of it until now, don't worry. It’s pretty simple and very worthwhile if you love Madewell's jeans as much as one of our reviewers does. You head to a Madewell location with a pair of your old jeans (any brand will do) and the store gives you a $20 credit for your donation. Madewell says they accept all “pre-loved” jeans regardless of style, cut, or color. But there are a few things to be aware of before you raid your wardrobe. Firstly, the $20 credit you receive is only valid on full-price Madewell jeans (not for any of the other brands they sell online or in stores or for any sale items), but it can be used on the spot or saved for a future purchase. And what if you have multiple pairs of jeans to donate at once, do you get a few $20 credits? Sorry, but no. Madewell only provides one $20 credit per visit, regardless of the amount of denim you donate. However, when I reached out for clarification, a Madewell rep confirmed there’s no limit to the number of times a shopper can make a donation. So you can donate them one at a time and receive the $20 credit for each pair (but no, you can't stack the credits either). How do you donate your old jeans? The Madewell site only mentions bringing your jeans into one of their brick-and-mortar stores for a credit, but it also appears there’s a way to ship them via mail. When one user commented, “What if I don’t live near a store, can I still send them in somehow and get a credit?” the company responded with “online orders are being shipped with a bag that can be used to mail in your jeans as well!” The rep I spoke to further clarified this claim, explaining that while mailer bags are offered in outbound packages at certain times of the year, there’s currently no way for a customer to request one. What can you use your $20 credit for? As far as what to purchase with your 20 bucks? As mentioned, the credit is only valid toward one pair of the brand’s jeans that are full price. 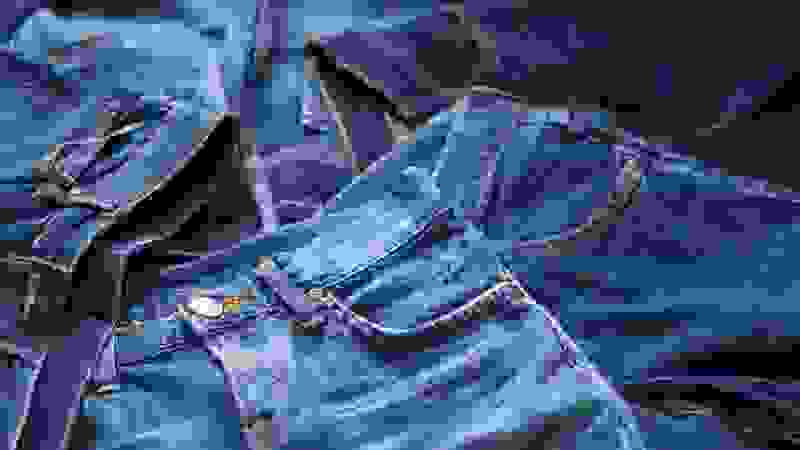 The site currently offers a variety of jeans for men and women with prices averaging between $95-$135. And if you're really trying to be more environmentally friendly, check out Madewell's new eco-collection of Fair Trade denim jeans, which debuted late last month. These jeans are made of organic cotton denim, and the process requires 65 percent fewer chemicals and 75 percent less water than the conventional denim making practice. What does Madewell do with all those old jeans? After you’ve walked away with your $20 credit, exactly what happens to the old threads you donated? Through a partnership with Blue Jeans Go Green and Habitat for Humanity, the jeans are not resold or upcycled into other clothes. They're actually transformed into insulation for those in need of a home. Non-cotton materials (rivets, zippers, buttons) are first separated from the cotton, which is then shredded, treated, and formed into housing insulation. "Since starting our denim recycling program in 2014, over 520,000 pairs of jeans have been recycled, which has diverted over 260,000 tons of waste from landfills and insulated over 690 houses,” said Libby Wadle, President of Madewell. While doing good and being eco-chic is always a good thing, is it worth it for the average shopper to donate their jeans compared to unloading them at a nearby thrift shop? If you’re already a Madewell shopper and there’s a location near you, then it’s an absolute win-win. And if you want to take comfort in knowing your donations are finding a good home (well, actually being a part of someone’s home! ), then it’s also a no-brainer. However, if you have jeans that are in impeccable condition and want to make a bit of cash off of them, try selling them to a secondhand store or on an app like Poshmark. And if they're not quite resellable but still very wearable, you can always donate them to a charitable organization or even directly to someone who will get more wear out of them. Do any other brands offer programs like this? Madewell’s sister brand, J. Crew, also participates in the same denim recycling program. And other retailers have similar initiatives that reward shoppers for being more eco-conscious, as well. For instance, H&M provides shoppers 15% off their next purchase for every bag of unwanted clothing they drop off. The denim originator itself even has collection boxes in stores that accept any brand of clothing or shoes, and shoppers who donate receive a 20% off voucher for their Levi’s purchase.